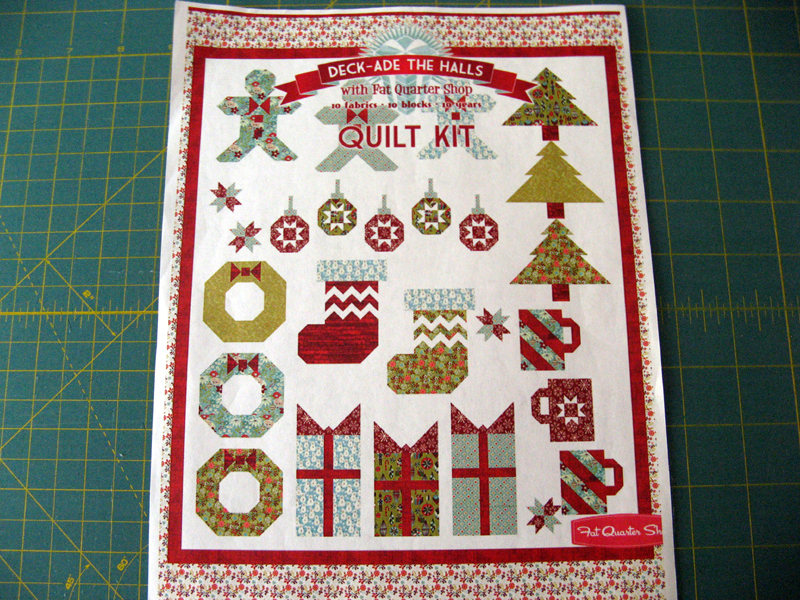 Today I have on my design wall my Deck-Ade The Halls project by The Fat Quarters Shop. There are two downloads yet to be published. One is the mugs and the final is the layout instructions which contain the sizes of the coping strips. All of the downloads are still available if you want to make one for yourself. 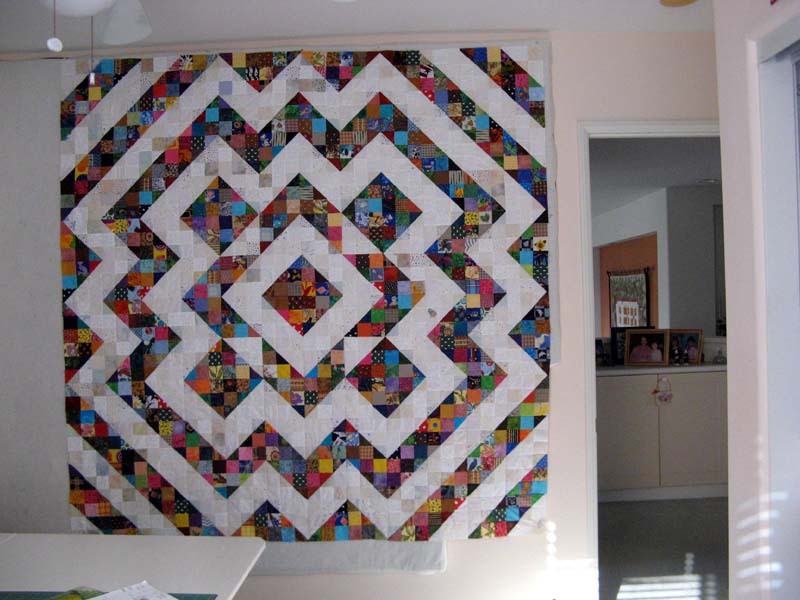 There are five members of the Sunshine Quilt Guild who took this on as a summer project. We've met a few times at Jennifer's home. Today we met to share our projects progress, enjoy a terrific salad lunch, and have some fun with Left Right Center for FQs. I turned out to be the lucky winner. It had to be beginners luck! 24 FQs came home with me...the start of another project :)! I will be putting Deck-Ade The Halls back in its storage bag until the mugs instructions are released. Next up is the finishing of Wendy's L-Medallion project. 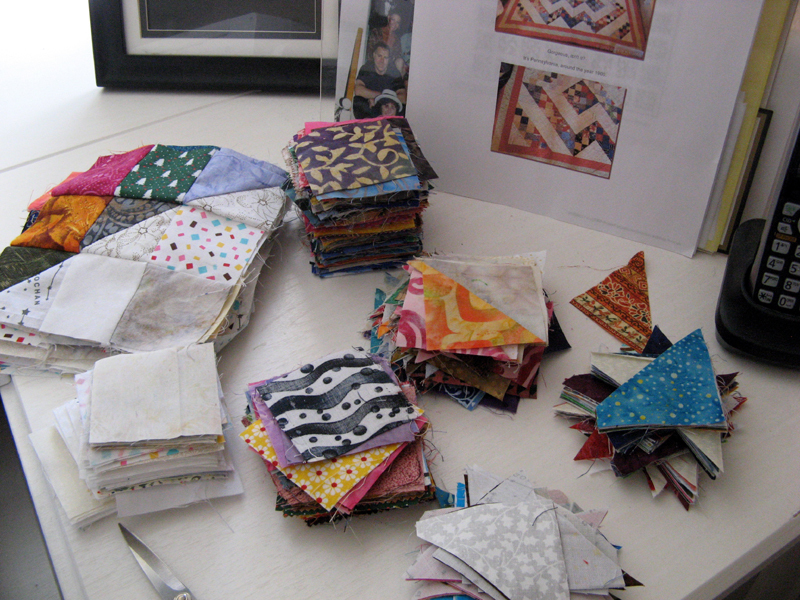 I have a number of the pinwheels ready for sewing now, but lots more to cut before I start piecing again. 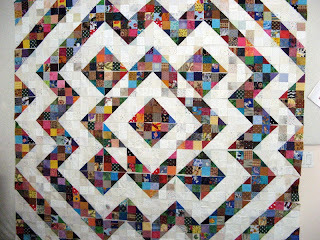 The San Diego Quilt Show is about two weeks from today. I gathered the last of the fabrics I will use in the Joyce Weeks class, Survivor, that I am to take on September 5th. I'm working on binding two quilts for turn in on September 2nd, but that shouldn't be a problem since I love to bind... Hope you find time to do what you love this week. 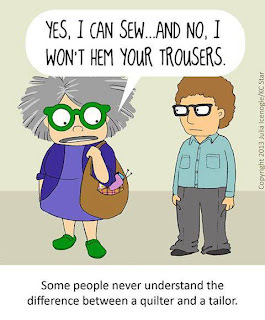 Grab some coffee and see what others are working on at Patchwork Times. 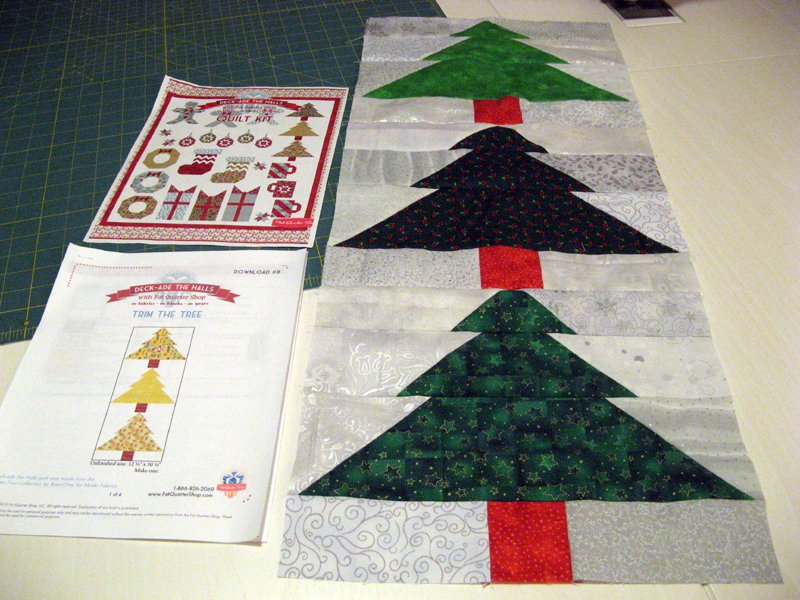 I started and finished the size I want this project to be on Bonnie Hunter's 2013 Summer Leader and Ender project. The split 9 Patch is complete for me; I'll be calling mine Kwiver (thanks Janet O.). Mine is made with 144 blocks. 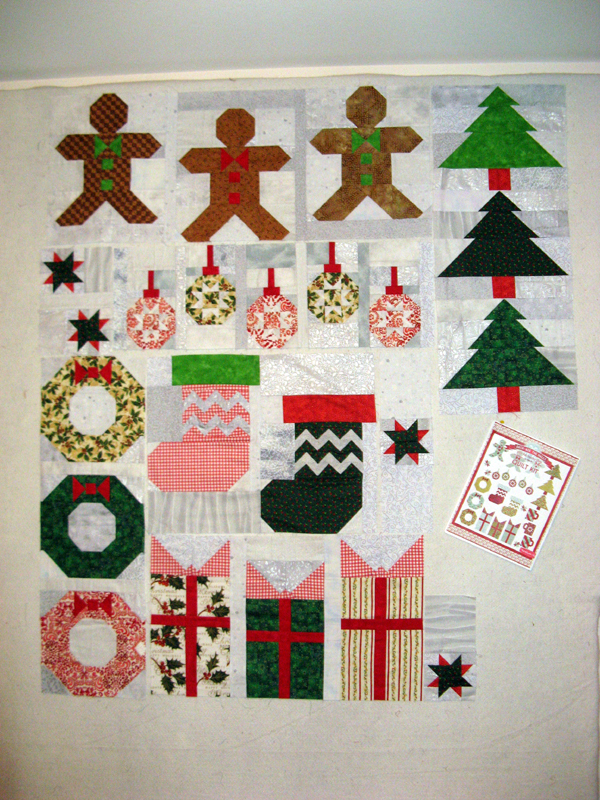 I decided not to add the three borders Bonnie shows from Pennsylvania on the instructions. Instead I added blocks all the way around. 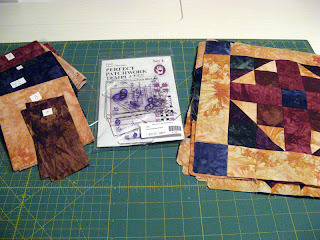 I will probably finish off in the binding with something consistent. Happy with how this project turned out. I did add a bit for the class I will be taking at the San Diego Quilt Show in two weeks. 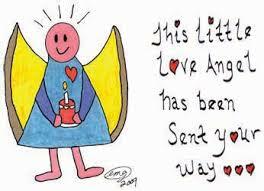 It is with Joyce Weeks called Survivor on September 5th. 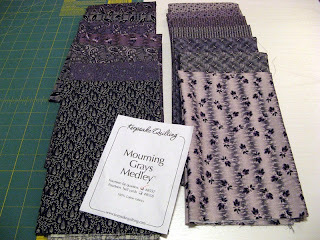 These fabrics are from Keepsake Quilting called Mourning Grays. I added a very small amount from my stash; too bad but not heavy in the reproduction fabrics to get from. Kerry plans to see what she has that might add more variety to the mix. I've already landed upon a name for my Survivor; what do you think of Konqueror? I'm busy planning and purchasing my next projects. I've got four on the "burner". Fabric for Kartwheels that needs a binding, fabrics for a Buggy Barn class, and a special birthday project for my sister that turns 50 this year. 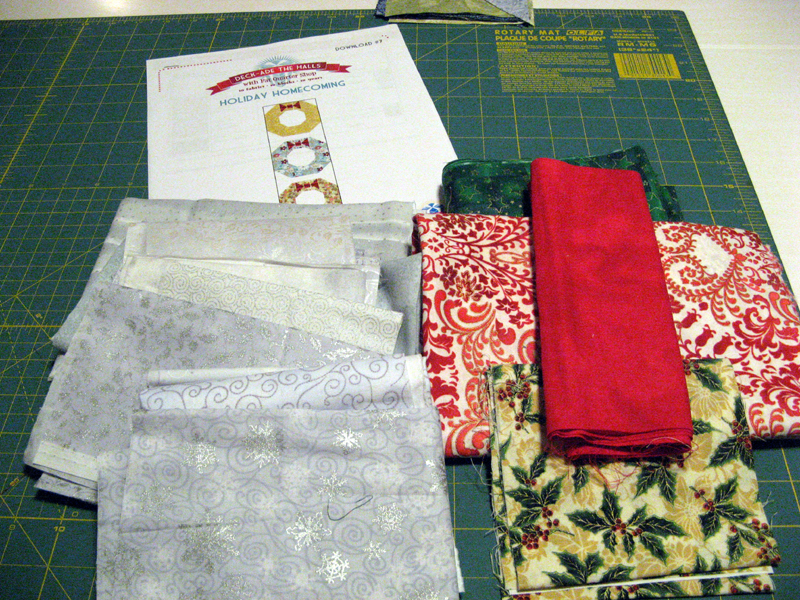 Today I'll be sewing down the binding of Koriander Kompass and having fun at a social at Jennifer's home showing off progress on Deck-Ade The Halls. I'm pushing o get to 200 yards used; wish it wasn't necessary to purchase to complete! 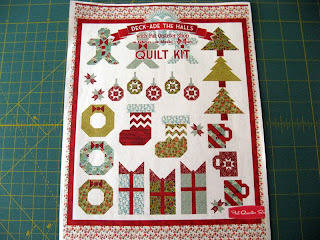 For more stash busting quilters see the many links at Patchwork Times. Tuesday night's sewing projects. First up "Trim the Tree". This is download #8, part of Deck-Ade The Halls. Just one more download to go before assembly. My part of the Sunshine Opportunity Quilt for 2013 -2014 is done. 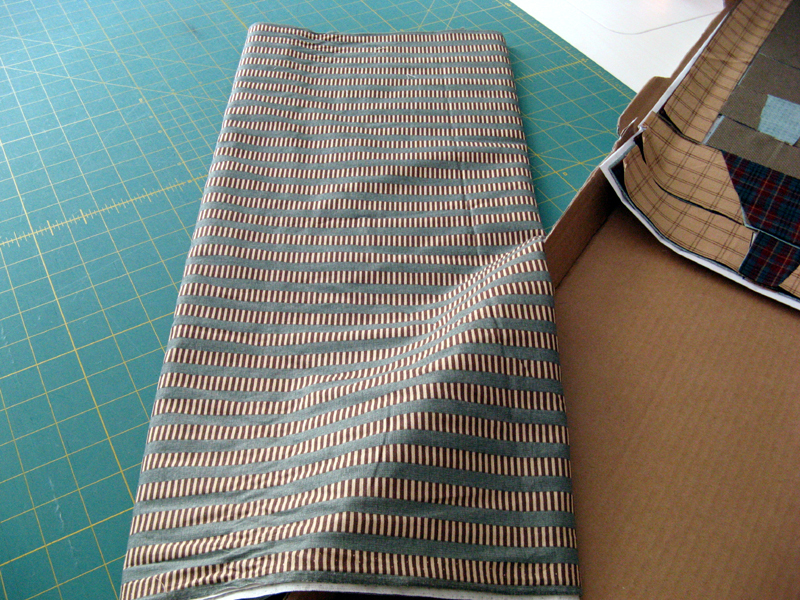 Binding, sleeve, and label in place. Tickets are available if you want a chance to win this beauty. Happy Monday! Can you believe we are halfway through August already? 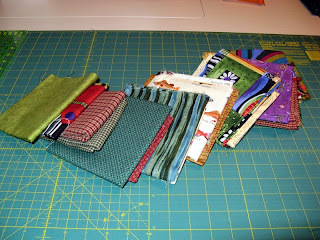 I've made a pretty good dent in my 2 1/2" squares and strips with Bonnie Hunter's Summer 2013 Leader and Ender Challenge! Split 9 Patch! I even made it larger than the gorgeous example she pictured from Pennsylvania circa 1900. Just like the last project, Korral, that I finished recently...this one presented a challenge getting all the 9-patches going the right way. 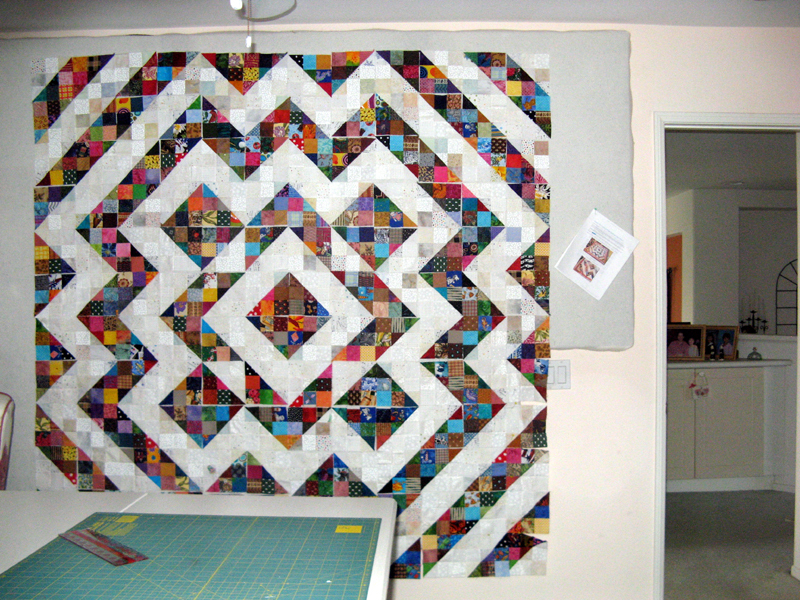 I think I have it right now, but will need to look with a fresh view tomorrow before I start sewing the blocks together. I'll be thinking on a "K" name in the meantime. Are there any suggestions that come to mind? Once this was on the wall I started working on the next download of Deck-Ade The Halls. It's the trees this time. All the pieces have been cut for sewing to begin later tonight. The next social at Jennifer's home is Sunday. I'm sure to be up-to-date by then. Everyone coming is to bring something to add to a salad. Sounds like we will be having a good time too as we'll be playing Left Right Center. I've not played it before have you? The ante will be three FQs. 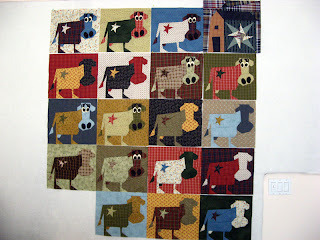 Lot's of others working on their projects; take time and check them out through the links at Patchwork Times. 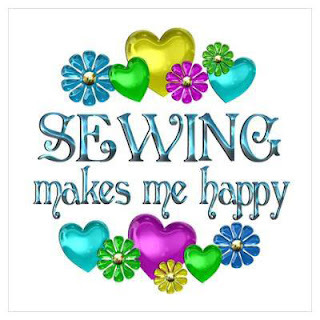 Enjoy your sewing room as much as you can! I had my Pfaff in for a full service this past week. I use it so much that it deserves the good work Eddie gives it every four months. Paradise Sewing in Poway is where I go. I purchased my last two machines from there and appreciate how Jinny and her staff take care of me. 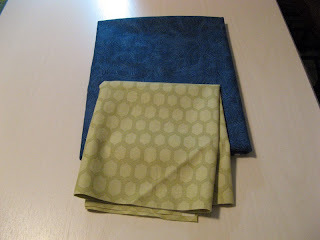 The day I picked up my machine two pieces of fabric to finish Korral came home with me. They have already been USED. I am excited to have another finish this week to report with just a little bit purchased. 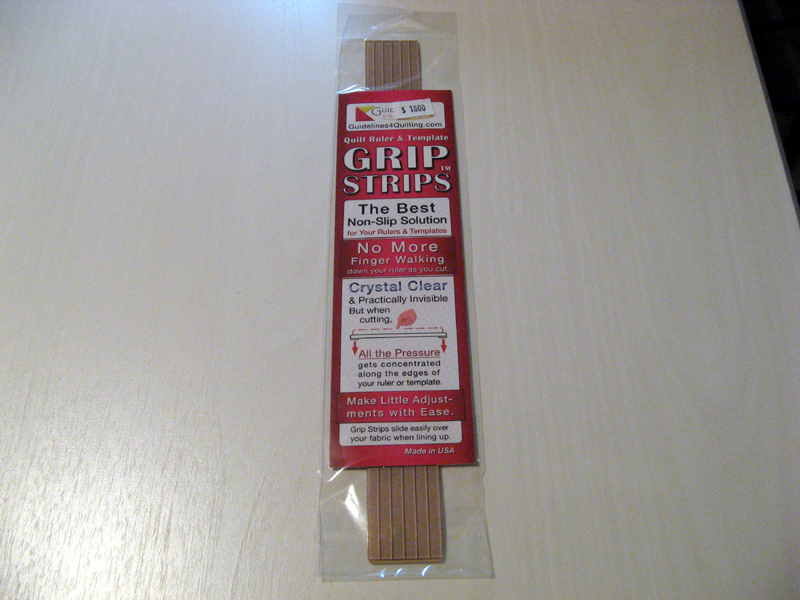 It was suggested that I had to take these GRIP Strips home with me too. I was a bit hesitant until I tried them out on a ruler that had them applied to it. Oh my...if you DON'T want any possibility of a slip with your rulers give these a try. Six 1/4" wide x 11 1/2" long clear adhesive strips to a package. I'd show you how they look on my ruler, but being that they are clear you can't see them. The length is easily cut to size. They are applied on the measurement sides of the ruler. When you press in the center to cut the fabric the ruler won't budge. They are a bit costly I thought, but as long as the adhesive holds them where they are put I will be happy. So today I have changes to my report. 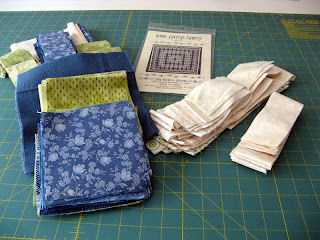 For more stash busting quilters see the many links at Patchwork Times. One of my coworkers sent me this...said he thought of me when he read it. Isn't it the truth! I spent time this morning taking apart and putting back together Korral. 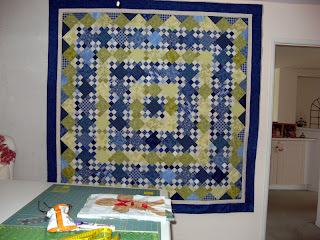 When I thought I had only the last border to sew in place; it turned out to be much more :(! I had six 9-patches turned the wrong way. Five in one row and one all by its lonesome. I was so happy to discover my error before it was quilted. 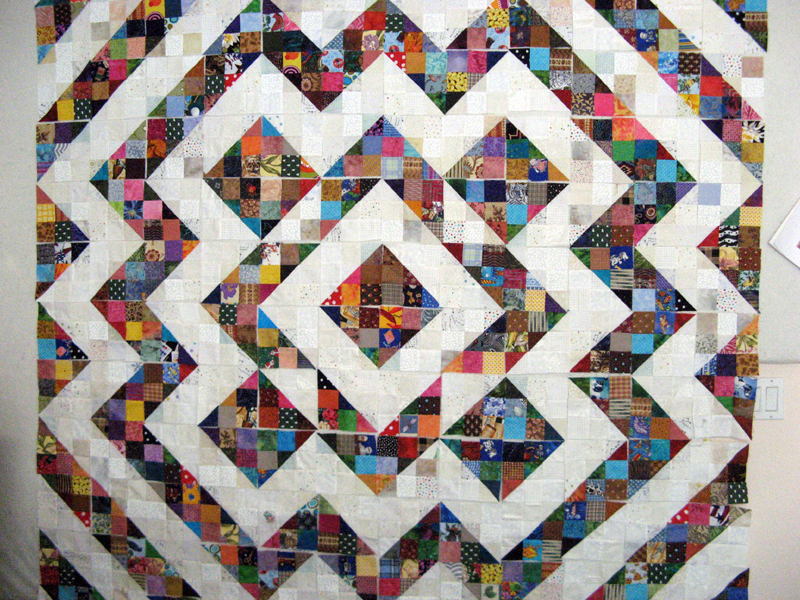 I'll have this one to Kerry's Quilting soon. It will be recorded on Sunday's Stash Report as stash used to the tune of 12.5 yards. It's also ready for Aunt Marti's Thirteen in '13 UFO Challenge parade that will be on September 1st. As you can see in the picture with Korral that I was also working on Deck-Ade The Halls. 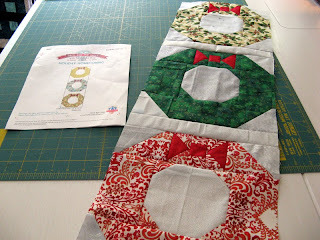 I'm up-to-date today through download #7 which are the wreaths. I think the trees are next. This is the finished project. Here is what my project looks like so far. Once Krazy Kattle was down from my Design Wall...Korral was put up. 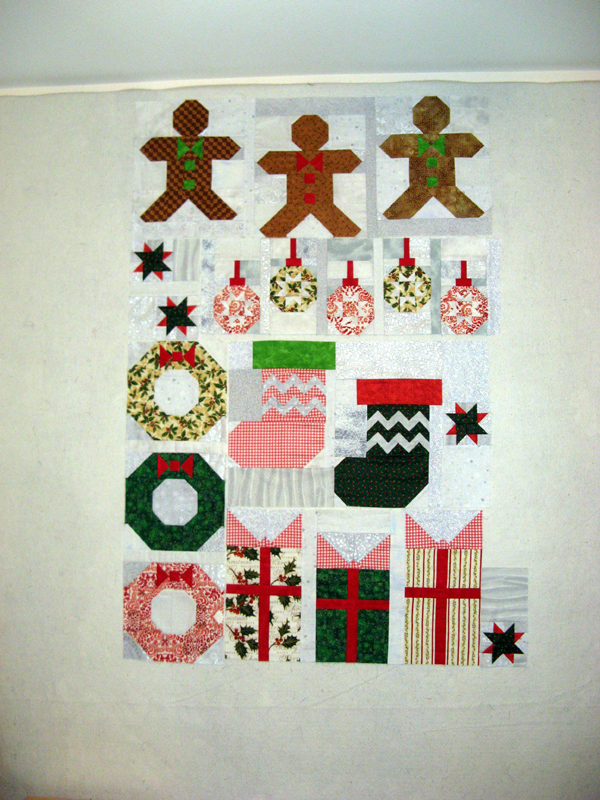 I had all the 9-patches done just waiting for the Design Wall space. This project needed quite a bit of arranging. It did get quite complicated making sure the 9-patches were oriented correctly. At one point I had two of them wrong and it was a real challenge to find where the wrong ones were located. 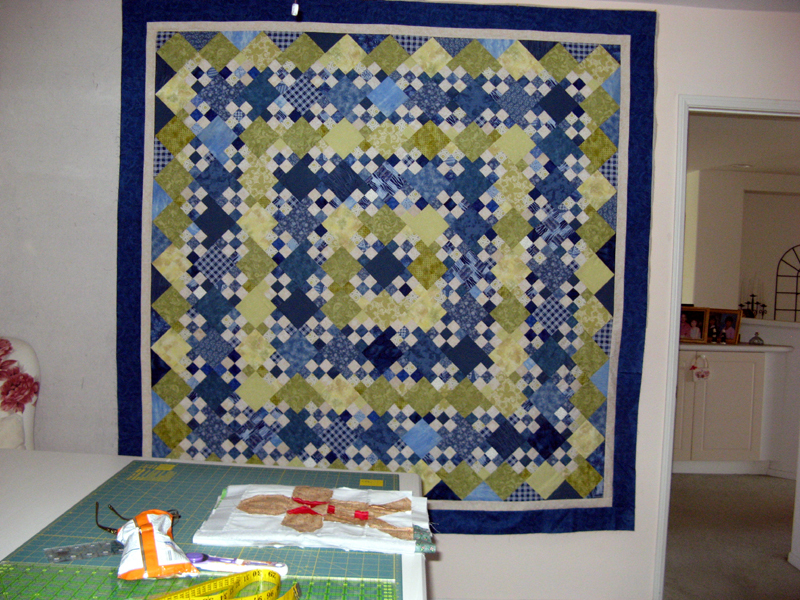 After that delay sewing the diagonal rows together was a breeze. Korral is my 2013 August UFO. I am anxious to get this one done so I can get in a few other projects the last half of the month. I have the wreaths to assemble on the Deck-Ade The Halls project. I don't want this one to get behind. On the 19th another piece of the project will be released. The next social at Jennifer's will be on the 28th to share our progress and I will want to be up-to-date. Later this week I plan on getting back to Wendy's L-Medallion project. I hope you are achieving your goals and having as much fun in your sewing room as I am. 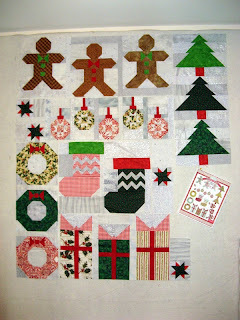 There are lots more projects to be seen at Patchwork Times today. Yeah a completion to report this week. Krazy Kattle will soon be in the hands of Kerry. I'm very pleased with the way it finished. I have been giving some thought to adding a cat near the front door of the house. After all I need to put a cat in this project somewhere. 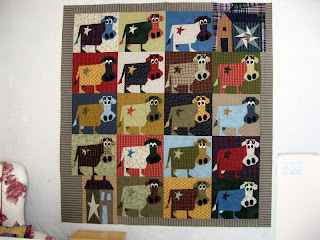 I hope to find a quilting design with the word "MOO" in it. 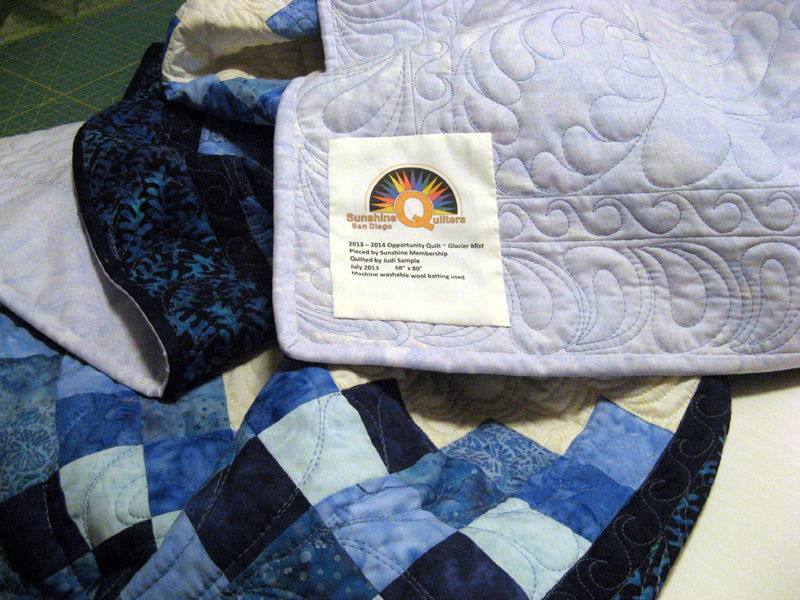 No clue until I audition some threads as to what it should be quilted in. I'll be ready for show and share at the next Buggy Barn class that is scheduled for September 7th. I'll be making another very cute design that has witches in it! 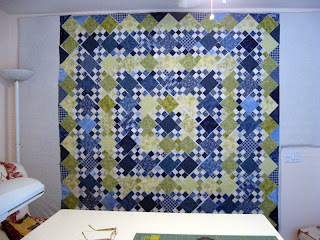 Now that my design wall is clear of Krazy Kattle I will be laying out Korral. All of the pieces are cut and pieced. Needed space to come up with the best arrangement. Com back and visit tomorrow for a glimpse. I started Sunday off putting together the 9-patches for Korral. 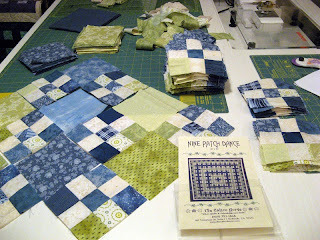 This pattern by The Calico Horse called Nine Patch Dance is my UFO Challenge for August. 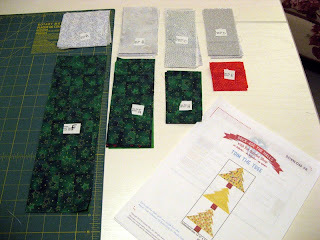 Aunt Marti of 52 Quilts hosts the UFO Challenge that I participate in for 2013. Our July finishes were on parade last Thursday at her blog and she also selected #11 to be finished in August. I already had most of it cut out which made the putting together pretty quick. As of this morning I need only 11 more 9-patches with a green corner. I'll need every bit of my design wall to get this layout figured out. The project finishes at 80" x 80". 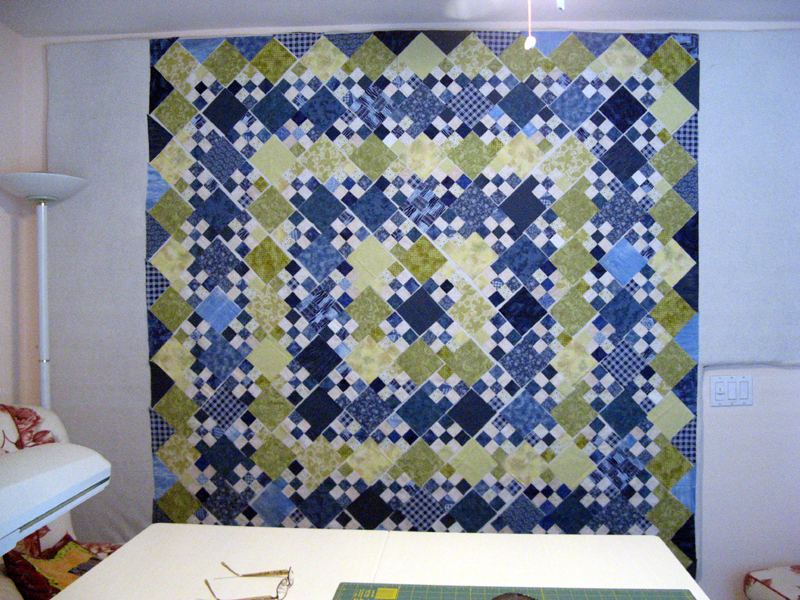 Krazy Kattle is still on my design wall. Until it can be assembled it won't come down. 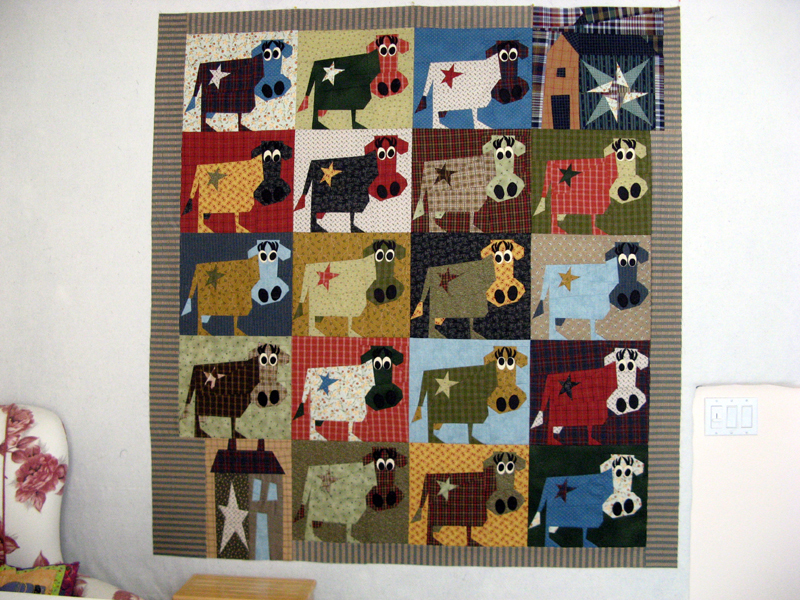 I am doing by hand the blanket stitch around all the eyes, brows, and nostrils of the cows. This does take sometime as you can imagine. 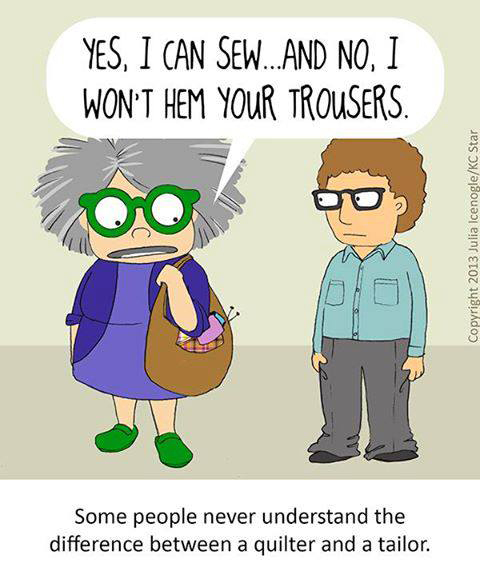 I will be stitching a little during my lunch break today. 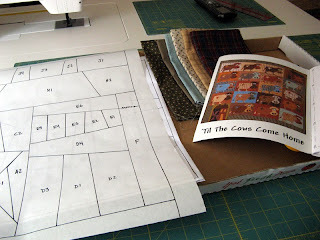 There are lots more fun projects going on right now in sewing rooms everywhere. 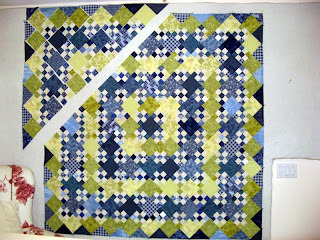 For lots of inspiration take time to enjoy the projects of others through the links at Patchwork Times. I went to Country Loft on Friday for the black felted wool to be able to finish the cow's. While there I found this stripe for the borders. As you can see I am already putting it to use. For today's report I have an add...although this yardage will soon be a used. What do you think of my Krazy Kattle? Happy Birthday Steve...you are always in my heart. 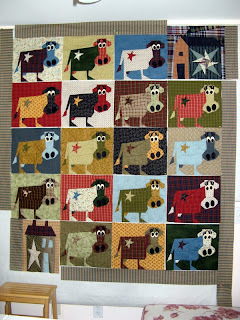 Here is where I stand with Krazy Kattle the Buggy Barn pattern called Crazy 'Til the Cows Come Home. The barn is done along with the trimming of all the cows. 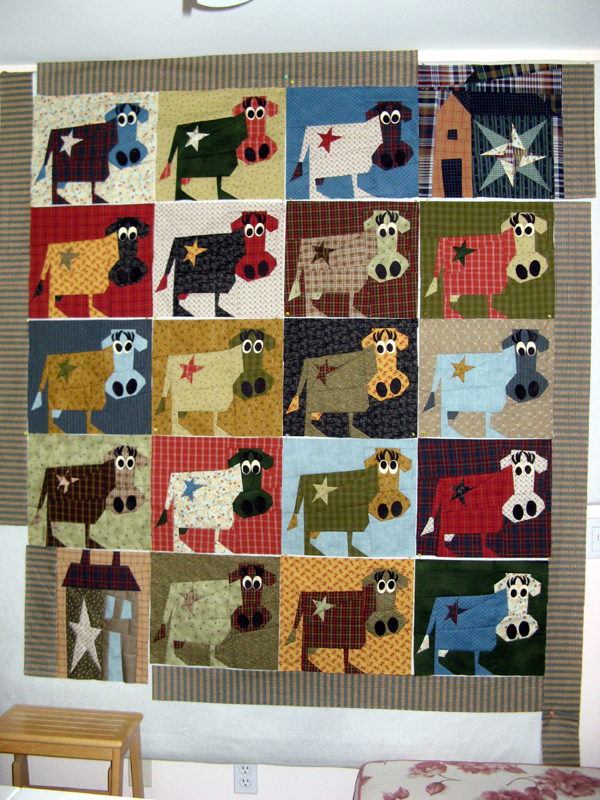 I trimmed my cows a bit larger than the pattern called since I would have taken off too much of their feet when the blocks are sewn together. I have eyes, brows, and nostrils on many of them, but the remaining need a trip to a LQS for more black felted wool. I should be okay with the cream felted wool to finish the eyes. I also need to find a stripe that goes with the whole project that becomes the outside border. The house is longer and skinnier than the cows also the barn is taller and wider than the cows. 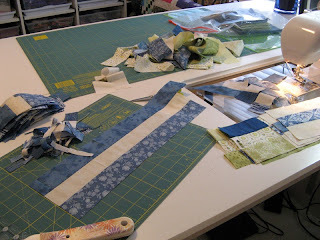 These elements make the border pieces all different in size when the time comes to cut. Below is the start to the house. 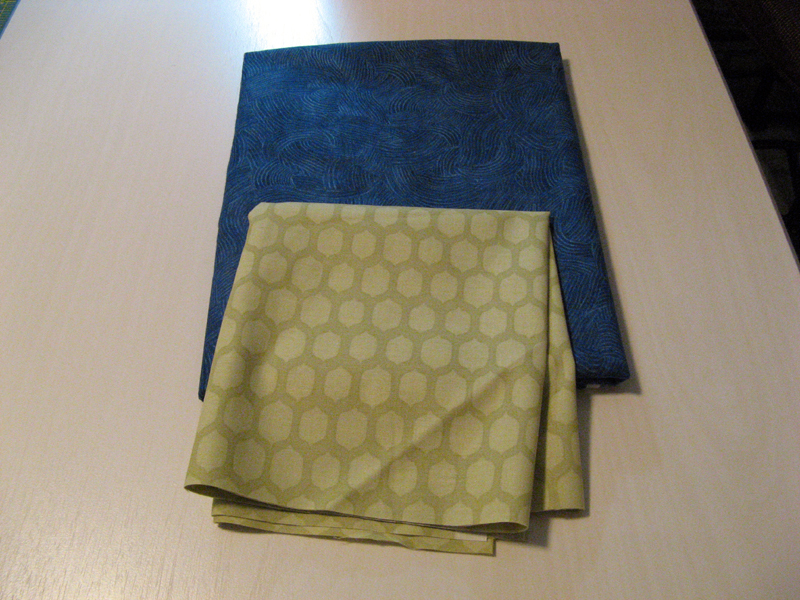 Fabrics selected and pattern copied onto freezer paper. Today being the first day of a new month of 2013...Marti of 52Quilts has selected the next UFO number to be worked. It is #11 which for me is Nine Patch Dance by The Calico Horse (seems they've changed their name?). It is made up of 100 9-Patch blocks in three different color combinations. I'm using blues, greens, and ivorys entirely from my stash. 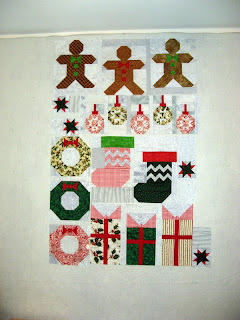 If you've been following my blog you'll know that I love constructing 9-Patch blocks in any size. I'm suspecting Korral (since it is already cut) will materialize quickly. It has been great having Bonnie Hunter's 2013 Split 9-Patch Leader and Ender project going on while I sew the Buggy Barn pattern...there is practically no chance for chain stitching any of it. In the meantime lots of progress has been made on this project too.